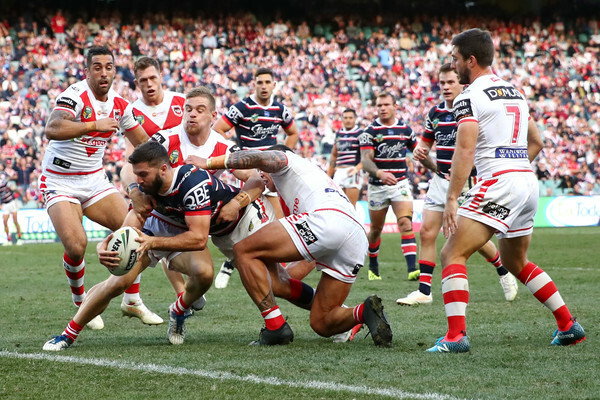 The Roosters might have put in a superstar performance last week against the Sea Eagles at Brookvale Oval, but Sunday’s performance against the Dragons was almost as good, especially when you consider the kind of form that St. George-Illawarra were showing earlier in the year. Decimating them 36-18, Sydney City came away more confident than they have been at any other point in the 2018 season, while the loss cemented the form slump threatening the Red V over the last month or so. The game started strong for the Roosters, with an offload from James Tedesco and some big runs from Daniel Tupou and then Blake Ferguson gaining the hosts some early momentum. Only a pair of clutch efforts from Tariq Sims and James Graham managed to prevent an early try, but Graham undid his efforts with a knock-on, setting the Roosters up with another shot at four points from halfway up the field. They made the most of it too, as Cooper Cronk made the decision to send the ball over to the left of the field rather than kick at the end of the tackle count, laying the platform for Latrell Mitchell’s most stunning moment of the year so far – a barging run at Euan Aitken, who he cast aside before disposing of both Ben Hunt and Jason Nightingale to get the footy to ground in the midst of a whirl of St. George jerseys. Getting rid of one of the NRL’s strongest centres was impressive enough, but Mitchell hadn’t even been running in from that deep, relying simply on the sheer strength of his fend on Aitken to propel him through Hunt and Nightingale in turn. While he may not have added the extras, the try itself was Origin-like in its intensity and vision, galvanising the Chooks to score again almost immediately. This time, it was Joseph Manu who provided the vision with a backwards flick pass that allowed Blake Ferguson to gain some speed and possession on the right edge. Finding himself trapped against the sideline, Fergo booted the football back on the inside, where Tedesco read the play perfectly and got it to ground. With Manu adding the kick, the Roosters had now got to 10-0 in the space of a few minutes. Both tries had been brilliant, but they had been brilliant in different ways, showcasing so many facets of the Sydney City arsenal in such a short space of time that it felt almost inevitable, from this early stage, that they would come away with the win. Sure enough, Sio Suia Taukeiaho built a platform for Cronk to set up a linebreak for Tedesco a few sets later. Plunging his way through the ruck, Teddy then offloaded back to Cronk just as Jack De Belin was bringing him to ground, and with Mitchell adding the kick the Chooks were now a stunning sixteen points ahead. The Dragons needed a dramatic turning-point, and for a moment they seemed to have received it, after a bizarre brain snap saw Fergo and Teddy collide under the high ball. If the head clash had been slightly more serious, the Roosters would probably have seen their two biggest metre-eaters led off for an HIA, but they managed to regather and defend their line after St. George got the ball back again. Still, the Roosters weren’t quite able to translate their acumen into points over the back half of this first stanza, despite a mammoth effort from Tedesco that took three Dragons defenders to prevent him planting the ball to earth. They gave the Red V a run for their money, though, and by the time that Ben Hunt made the most of his markers’ fatigue to scoot past Lindsay Collins and Isaac Liu out of dummy half with fifteen seconds left on the clock the emotion was more relief than exuberance for the away crowd, despite the fact that this marked the ex-Bronco’s 50th career try. The Tricolors didn’t take long to reassert their dominance in the second half, however, with Ferguson spearheading a massive effort to drag Tim Lafai into touch that laid the platform for the next home try. With Luke Keary getting within centimetres of the touch line on the first tackle – only a last-ditch trysaving tackle from Frizell held him up – the Dragons were on the front foot from the very beginning, and Cronk capped it off with a superb last-tackle kick to the left corner. From there, both Tupou and Nightingale appeared to have made contact with the ball in the air, bopping it forward for what initially appeared to be a no try for the Roosters, despite Mitchell grounding it beautifully right on the line immediately after for a stop-and-plant move that recalled Brian Kelly’s gymnastic effort against the Panthers the afternoon before. The onfield ruling was no try, and yet the replay showed that only Nightingale had got a hand to the footy, clearing up Mitchell for another four points, although once again he was unable to add the extra two. Still, this was an amazing effort already from Mitchell, and while a leg injury that saw Keary led off the field a few minutes later momentarily quashed the Roosters’ momentum, they regrouped pretty quickly, thanks to some quick thinking from Fergo that forced a penalty from the Red V. At the other end of the field, Friend stepped up with his kicking game in Keary’s absence to force a dropout, at the end of which Mitchell slammed over once again. He’d shown us how he could fend Aitken from close range at the start of the game, but now he absolutely bulldozed through the Dragons centre from ten metres out, for the second hat trick of his NRL career. There could be no doubt, now, that this was the best club performance of Mitchell’s 2018 season – a scintillating display of strength and speed that rivalled anything he brought to his stint with the Blues this year as well. It felt right, then, that this was also the first conversion of his own that Mitchell managed during this game, booting through a challenging sideline conversion to bring the Chooks to a twenty point lead. As amazing as it might sound, the most spectacular try of the evening was yet to come, since even Mitchell’s brilliance couldn’t compare to Tedesco’s vision a couple of sets later. Judging the speed and direction of Widdop’s fifth-tackle kick perfectly, the New South Wales fullback simply scooped up the Steeden and ran eighty metres before the Dragons knew what had hit them, with only De Belin coming close to him. So rapid, strong and surprising was Teddy’s try that it inevitably overshadowed Hunt’s double, which occurred a couple of minutes later, and felt as lacklustre as his four points at the end of the first stanza, despite being a pretty impressive try on its own terms, and coming off the back of some deft handling from Luciano Leilua. Before the Red V could get a chance to enjoy it, though, a brilliant short ball from Mitch Aubusson set up Ferguson to scoot past Lafai and Widdop to put down his own four points – appropriate for a game in which he’d been so critical in organisation – bringing him to his equal best tryscoring tally in a single NRL season. From there, Tariq Sims would score one more try, at the seventy-fifth minute, but Fergo’s four-pointer had the final word, for a stunning sequel to the Roosters’ decimating performance against the Sea Eagles last weekend. They’re going to be looking to continue this momentum, then, when they take on the Cowboys at home next week, while the Dragons need a convincing victory over the Warriors at WIN Stadium on Saturday to start renewing their self-belief as finals footy draws closer.